Geesh where has the time gone? These last couple of weeks have been so busy and I can’t seem to catch up. I think between trying to get ready for baby boy, Madeline being a terror at bedtime and trying to work ahead 3 months to get things ready….I barely know whether I’m coming or going! I have about 6 weeks until my due date, but who knows when this little guy will want to make his entrance into the world. I’ve been dreaming about going into labor on June 6th, so we’ll just have to wait and see. I had made this recipe back on Easter for lunch at my mom’s. See I told you I can’t seem to catch up! 🙂 It was a nice change from our traditional fare and definitely something that can be changed up using different veggies depending on what is fresh. It would be great to change it up to a Greek style in the summer when cucumbers and tomatoes are in abundance! Rinse quinoa throughly according to package instructions. In a medium sized pot, bring the stock and quinoa to a boil. Reduce heat and cover until quinoa is cooked according to package instructions, usually between 20 and 25 minutes. While the quinoa is cooking, melt the butter in a large skillet over medium-high heat. Add the garlic and cook for one minute until golden. Stir in vegetables and cook 3 to 5 minutes depending on how tender you like your vegetables. 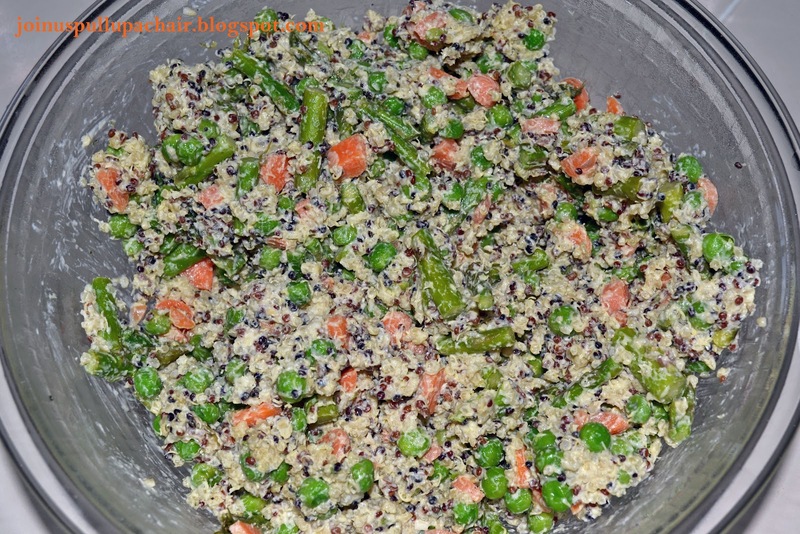 Dump the quinoa in a large bowl. Stir in the cream cheese and basil into the cooked quinoa. Add the vegetables and toss to combine. Sprinkle with the parmesan cheese. ← Just a little bragging..